When Lauderdale County was established in 1833 out of Choctaw lands ceded in 1830 at Dancing Rabbit Creek, there was already a settlement at Marion, named for the famous South Carolina “Swamp Fox” of Revolutionary War fame. Since the community was located near the center of the new county, it was the logical place to name as county seat. Meridian was incorporated in 1860, and, except for a setback in 1864 thanks to General Sherman, grew rapidly. In 1870, as a result of a public referendum, the county seat was relocated to Meridian, a few miles to the southwest of Marion. The county’s first courthouse was built in 1890 at the present site, where it stood until 1903, when it was destroyed by fire. 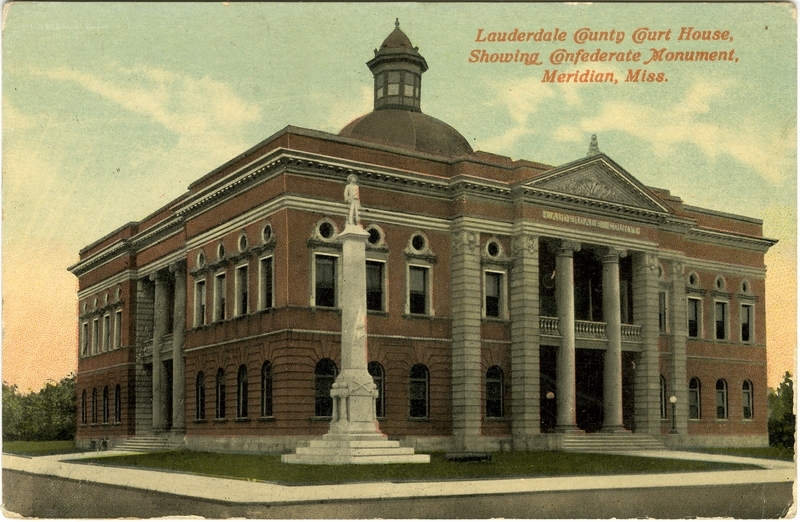 If there is a photograph of that first building, I have been unable to locate it, even after checking with the Lauderdale County Archives. 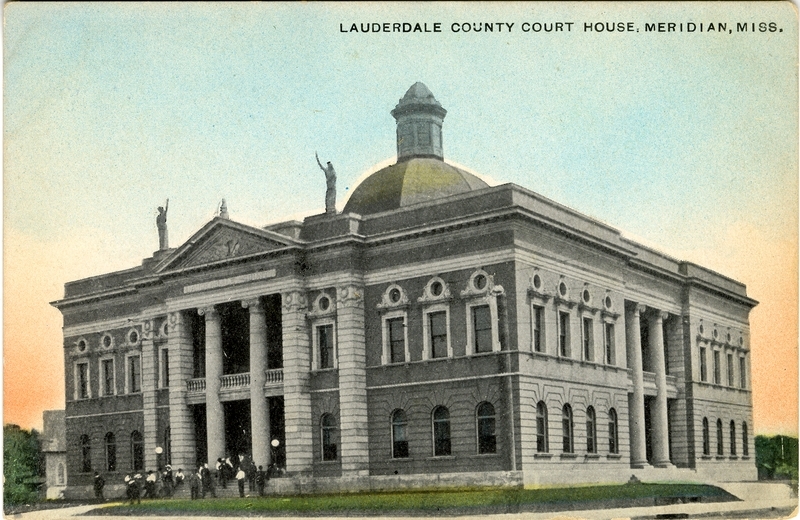 In 1904-1905, a new courthouse was built on the original site. It was in the Beaux Arts style in fashion at the time, and featured a dome with cupola and sculpted figures. Some time later, the statues were removed, and even later, probably in the 1920’s, a Confederate memorial was erected on the northwest corner of the site. You can click on the photos for larger, more detailed view. In 1939, the building was enlarged and extensively remodeled in Art Deco style. A jail was added on the top floor. The work was part of President Roosevelt’s federal works projects aimed at creating jobs to get the country out of the Great Depression. The building has remained essentially unchanged in appearance since the 1939 renovation. The photo to the left shows the west entrance in the early 1950’s. In the 1970’s, a ramp was built at the west entrance for handicap accessibility. The ramp originally bore the inscription LAUDERDALE COUNTY COURTHOUSE, but the lettering was replaced in the 1980’s by a marble memorial honoring and naming the military of Lauderdale County who were killed in war. A porch with benches was added at the south entrance in the 1980’s. In the late 1990’s, before the new jail on Fifth Street could be built, a metal fire escape enclosed by chain-link fencing was constructed on the east side, giving jail inmates an escape onto Nineteenth Avenue into a chain-link enclosure in case of fire. The fire-escape apparatus was removed after the new jail was completed and put into operation. 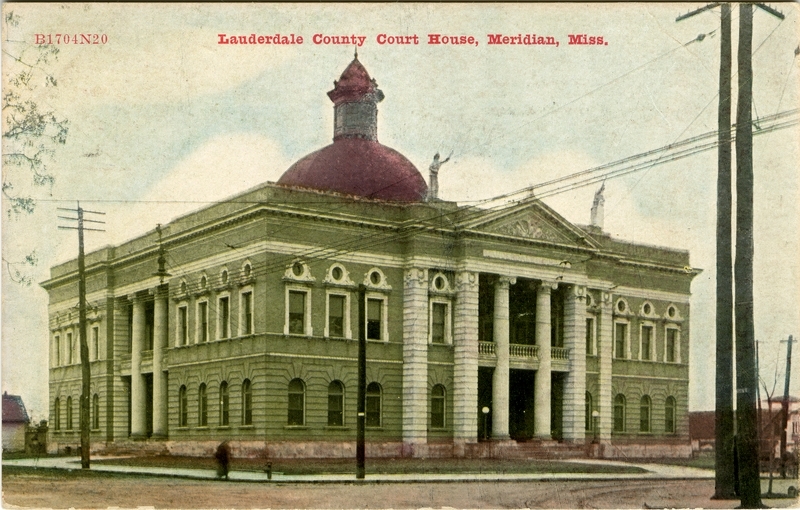 The courthouse was designated a Mississippi Landmark on April 6, 1999, and is listed on the National Register of Historic Places as a contributing element of the Meridian Downtown Historic District. The photos above, along with around 4,600 others showing scenes from all around Mississippi during the period from 1892 to the 1940’s, are available at the Mississippi Department of Archives and History’s website here. Above is a view of the courthouse as it appears today. 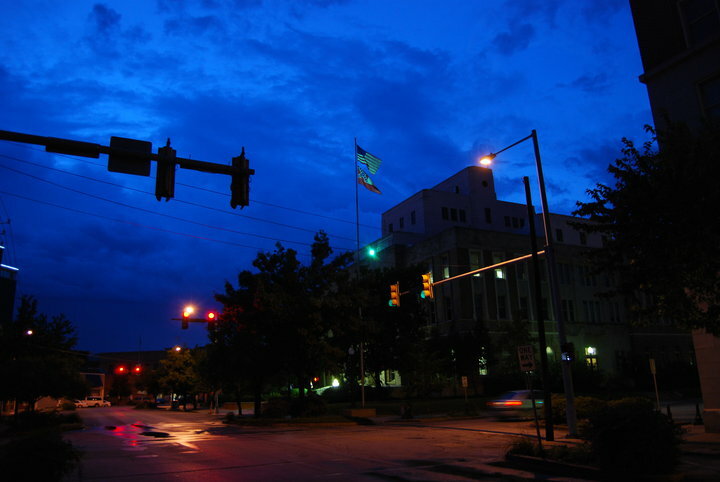 It shows the DA’s office lit up in trial preparation on a rainy evening. This unusual photo was taken by Meridianite Ken Flynt, and is used with his permission. 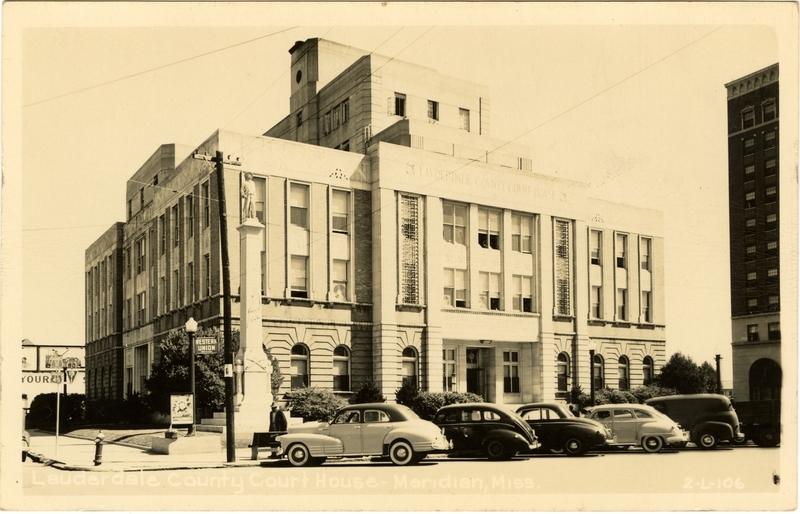 You are currently reading EVOLUTION OF THE LAUDERDALE COUNTY COURTHOUSE at The Better Chancery Practice Blog.